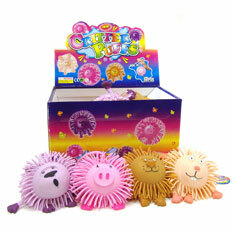 Inflated yo yo pom pom balls with little critter faces. Cute. Really cute. 5” with assorted critters such as pig, raccoon, and mice sold by the dozen. $8.85 per dozen for 18 dozen or more. $7.60 per dozen for 36 dozen or more.